Looking for the best arrows for 2018? Bowhunting World Editor Jace Bauserman picks five of his favorites. I first heard about the idea of a carbon-fiber stainless-steel infused arrow two years ago in an Oklahoma deer camp. Victory Archery General Manager Steve Greenwood and I were talking arrow technology when Steve got a gleam in his eye. “I want to run something by you,” he said. I was thrilled when he handed me the finished product at last week’s ATA Show. The XTORSION shaft infuses 304 stainless steel with Victory’s high-modulus carbon fiber to create a crazy-durable shaft that promises exceptional downrange accuracy and maximum kinetic energy. Available in two straightness tolerances (the +/- .003 GAMER and +/- .006 SPORT), the new XTORSION comes with Victory’s Shok aluminum inserts, but those can easily be upgraded to stainless steel. The Shok was designed to increase kinetic energy and front-of-center (FOC). Vista Outdoor Communications Coordinator Vic Ziliani couldn’t contain his excitement over Gold Tip’s latest arrow model: the Velocity Valkyrie. This four-fletched beauty comes in an array of outer diameter options, as well as multiple grains-per-inch (gpi) offerings. Boasting a .246-inch inner diameter and a straightness rating of +/- .006, the Valkyrie is available in multiple spine sizes, in half-dozen and dozen quantities, and with Accu-Lite Nocks and the appropriate matched-to-spine Accu-Lite Insert. The low-profile vanes increase surface area without sacrificing rest clearance or speed, which results in increased back-end stability, faster stabilization and tighter broadhead groups. Yes, I know the 5MM FMJ isn’t new, but this isn’t just some random arrow article. These are my top five picks from the ATA Show, and though I loved Easton’s HEXX FOC, I’ve had too much success with the 5MM to leave it off this list. “Our FMJ series continues to do so well for us,” Easton’s Gary Cornum told me. And, really, how could it not? The 5MM was designed to increase penetration with a 7075 metal jacket wrapped over a high-strength carbon core. The arrow’s micro-diameter helps it buck Western winds, and it boasts a straightness rating of +/- .002. Easton’s 5MM FMJ arrows come with pre-installed X Nocks and X HIT 8-32 inserts. Deep Six thread RPS steel inserts and brass X HIT 8-32 break-off inserts are sold separately. If retro is your thing, check out the limited edition 5MM FMJ in Woodland Camo, a look reminiscent of the classic Easton XX75 Camo Hunter. Carbon Express calls it “a breakthrough in controlling Dynamic Spine in a small diameter .203 ID shaft.” I will, having sent a number of the Maxima Red SD Badlands shafts downrange over the past few days, simply call it a win. Cloaked in Badlands Approach camo, the sleek and stylish Maxima RED Badlands SD boasts stiffer ends to contain arrow flex to what Carbon Express has dubbed the “Red Zone.” The Red Zone is the section of the arrow shaft engineered to contain Dynamic Spine and drastically improve downrange broadhead flight. The SD is available in sizes of 250 (8.3 gpi/400 spine) and 350 (9.4 gpi/350 spine) and boasts a straightness factor of +/- .0025. A litany of components (nocks, collars and inserts) are available. New from Bloodsport is the small-diameter Prosecutor, designed to bridge the gap between micro-diameter and standard-diameter arrows. Ready to rule the woods, this Rugged Wrap construction arrow is offered in four spine sizes (300, 350, 400 and 500) and features a .004-inch straightness rating. Weights on the Prosecutor range from 6.2 to 8.7 gpi, depending on the chosen spine size. I’ve been a fan of Blood Ring Technology since its inception, and I was thrilled to see this patented technology on these .204-inch inner-diameter shafts. The Prosecutor comes with Bloodsport’s new 32-grain outsert. What does that do for you? 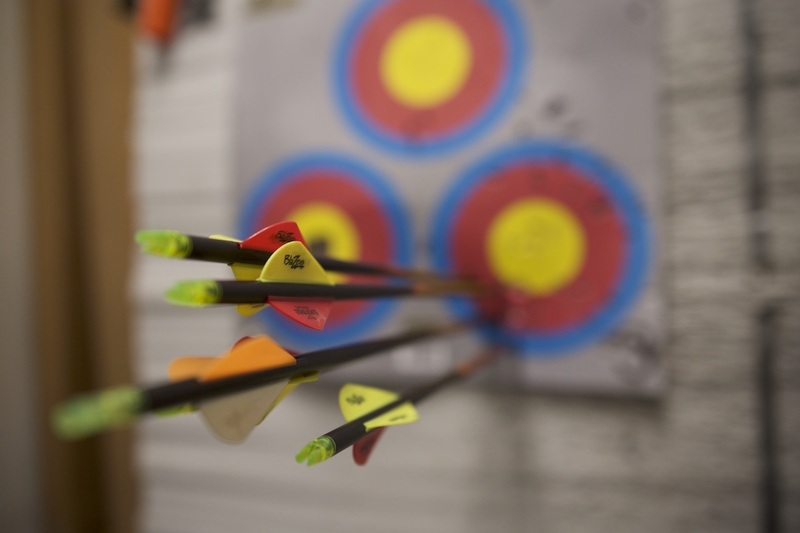 Lightweight arrows are more prone to damage, and that tough outsert absorbs shock to protect your shaft.